IBM System Storage TS1140 Tape Drive Model E07(machine type 3592) is the fourth generation of the highly successful IBM 3592 Enterprise Tape Drive. It is supported for integration in the IBM System Storage TS3500 Tape Library or racks that enable stand-alone installations. The TS1140 Tape Drive is designed to provide higher levels of performance, reliability, and cartridge capacity than the TS1130 Model E06 Tape Drive. It has a high-technology 32-channel GMR head design and provides a native data rate performance of up to 250 MB/sec versus the 160 MB/sec data rate of the TS1130 Tape Drive Model E06. The TS1140 E07 Tape Drive has a dual-port 8-Gbps Fibre Channel interface for Fibre Channel attachment to host systems or a switched fabric environment. With the use of the IBM Tape Cartridge 3592 Advanced Data (Type C), TS1140 Model E07 can format a cartridge uncompressed up to 4.0 TB (12.0 TB with 3:1 compression). TS1140 E07 is designed for automation and uses a tape cartridge with a form factor similar to other 3592 tape cartridges, allowing it to be used in the IBM TS3500 Tape Library. The TS1140 Tape Drive also supports drive-based data encryption to help protect your data. The TS1140-based encryption and associated IBM Tivoli Key Lifecycle Manager component are supported in a wide variety of operating system environments, including IBM Power, IBM System i, IBM System x, IBM System p, HP-UX, Oracle, Linux, and Microsoft Windows. Application, System, or Library Managed encryption management methods are supported. The encryption capability is supported when the TS1140 Tape Drive is integrated or attaches to selected IBM supported tape libraries, subsystems, or controllers. The TS1140 Tape Drive Model E07 is supported in a wide range of environments including selected IBM Power Systems� -, IBM System i, IBM System p, IBM System x, and other servers running AIX, HP-UX, Linux, Oracle Solaris, and Microsoft Windows operating system environments. Refer to the Software requirements section for details. The TS1140 is designed to provide up to 4.0 TB uncompressed capacity with the new IBM Tape Cartridge 3592 Advanced Data (Type C) media. The exact ratio depends on which cartridge is used with the tape drive. TS1140 E07 uses a design that increases the native data rate up to 250 MB/sec (up to 650 MB/sec compressed) versus the 160 MB/sec data rate of TS1130 Tape Drive Model E06. It is designed to offer improved access characteristics in search velocity and rewind time versus the TS1130 E06, with other enhancements designed to help aid small file and Hierarchical Storage Manager performance. Note: The actual throughput achieved is a function of many components, such as system processor, disk data rate, data block size, data compressibility, I/O attachments, SAN, and the system or application software used. Although the drive is capable of a 250 MB/sec native data rate, other components may limit the actual effective data rate. TS1140 Model E07 is designed to support capacity scaling of an individual tape cartridge to 20% of maximum capacity (800 GB for advanced tape cartridges). Capacity scaling lets the utilized length of tape to be logically shortened, allowing improved data access times in trade off for reduced capacity. The tapes can subsequently be scaled back to full capacity as needed. The TS1140 Model E07 Tape Drive allows an application to issue a command to scale the IBM Tape Data 3592 cartridge. This allows capacity scaling to be exploited by an application that permits media pools to be defined by VOLSER range. You can exploit the capacity scaling capability of the TS1140 E07. For more information on using capacity scaling, refer to IBM 3592 Model E07 Tape Drive Customer Information Center. The TS1140 E07 provides capacity leadership with media reuse and uses Type C tape cartridge with tape specifically optimized for the enterprise tape environment. This provides a native cartridge capacity of 4.0 TB (or up to 12.0 TB with 3:1 compression) and can be beneficial in space savings and economy of data storage since it can help lower the cost of storage per megabyte. For applications that fill current data cartridges, this can help reduce the number of tape cartridges required. The reduced number of cartridges may also help free up floor space for other requirements and reduce the number of automation slots used. The robust cartridge shell is designed to sustain a 1 meter drop. IBM Tape Cartridge 3592 contains cartridge memory that is a passive, contactless silicon storage device. It is used to hold information about the specific cartridge, including the VOLSER, the media in the cartridge, and the drive. The TS1140 E07 has dual-ported 8 Gbps native switched fabric Fibre Channel interfaces to offer attachment flexibility in an open systems environment. The drives can be directly attached to open systems servers with Fibre Channel. The TS1140 is supported in a wide range of environments, including selected IBM Power, System i, System p, and System x systems, Oracle, and Hewlett Packard servers, as well as Intel compatible servers running Linux and Microsoft Windows operating system environments. The TS1140 E07 uses Statistical Analysis and Recording System to assist in isolating failures between media and hardware. It is designed to use the cartridge performance history saved in the cartridge and drive performance history kept in the drive to determine the more likely cause of failure. It is designed to cause the drive to mark the media as degraded, and to indicate that the hardware has degraded. High-availability data path failover is available with the AIX, HP-UX, Linux, Oracle Solaris, and Microsoft Windows IBM tape device drivers. The failover mechanism is designed to enable configuration of multiple redundant paths in a SAN environment that includes the TS1140. In the event of a path or component failure, the failover mechanism is designed to automatically enable error recovery to retry the current operation using an alternate, preconfigured path without aborting the current job in progress. This supports flexibility in SAN configuration, availability, and management. Dynamic load balancing is a function in the AIX, HP-UX, Linux, Microsoft Windows, and Oracle Solaris tape device drivers that is also available for TS1140 E07 Tape Drives used in a SAN environment. Dynamic load balancing support is designed to improve resources for devices that have physical connections to multiple Host Bus Adapters (HBA) in the same machine. When an application opens a device that has multiple HBA paths configured, the device driver determines which path has the HBA with the lowest usage, and assigns that path to the application. The device driver is designed to dynamically track the usage on each HBA as applications open and close devices, and balance the number of applications using each HBA in the machine. This can help optimize HBA resources and improve overall performance. Enhanced performance: For functions such as Recursive Accumulating Backhitchless Flush (RABF), and the addition of a new Same Wrap Backhitchless Flush (SWBF) function that extends virtual backhitch effectiveness for large files. N+1 power supplies: The TS1140 E07 supports n+1 power supplies when it is installed in an automation frame, designed to help increase drive availability in the event of a power supply failure. Digital speed matching: The TS1140 E07 is designed to dynamically perform digital speed matching in 14 speeds to adjust the drive's native data rate to the net host data rate (after data compressibility has been factored out) to help allow slower hosts to stream the tape drive. Channel calibration: The channel calibration feature is designed to allow for customization of each read/write data channel for optimum performance. The customization can enable compensation for variations in the recording channel transfer function, media characteristics, and read/write head characteristics. The TS1140 E07 is designed to automatically perform recalibration in the field if it detects degraded performance. High resolution tape directory plus enhanced search speed: The TS1140 E07 Tape Drive maintains a tape directory structure with a high granularity of information about the physical position of data blocks on the media. This feature, plus the increased search speed, allows the TS1140 E07 to have improved nominal and average access times for locate operations versus previous IBM tape drives. Streaming Lossless Data Compression (SLDC) algorithm: SLDC is an implementation of a Lempel-Ziv class 1 (LZ-1) data compression algorithm. It is an extension to Adaptive Lossless Data Compression (ALDC) and is designed to offer an improvement over previous IBM lossless compression algorithms. Large internal data buffer: The TS1140 E07 Tape Drive has a 1 GB internal data buffer. Along with enabling higher performance characteristics, the data buffer is designed to use support read ahead of compressed data from tape and provide high performance random skip forward sequential (short hop) locates common in database search and tape software recycle operations. Offboard data string searching: The TS1140 E07 Tape Drive can search the data content of host records for string matches offboard from the host server. The tape drive can perform this search at maximum data rate (250 MB/sec native) while it would take much longer for a host server to read the data, buffer the data to disk, and then parse the actual data stream with host software routines. Enhanced logic to report logical end-of-tape (LEOT): LEOT is now reported based on a combination of capacity-based and position-based LEOT indicators. The TS1140 E07 monitors the total accumulated number of physical tape data sets written to the volume and will report LEOT based on this capacity-based LEOT value. This allows tape copies to complete without overflow a much higher percentage of the time. The TS1140 E07 Tape Drive is the next generation of the highly successful 3592 Enterprise Tape Drive. The TS1140 is supported in a wide range of environments, including IBM Power Systems, IBM System i, IBM System p, IBM System x, and other servers running AIX, HP-UX, Linux, Oracle Solaris, and Microsoft Windows operating system environments. It has significant performance and capacity benefits over the IBM TS1130, as well as other half-inch tape drives. Space allocated to tape cartridges needs to be reduced within automation solutions or offline storage. Backup windows are growing and there is a need for higher performance tape drives to back up larger amounts of data in less time. A Fibre Channel-attached drive with native switched fabric capability is required. High-speed data-save operations where backup windows are critical and large amounts of data are archived to tape. Large-scale automated tape installations where performance, capacity, and reliability are requirements. Large-scale mass data archive applications where massive amounts of data need to be quickly saved to tape for storage and later recalled (examples include the seismic industry, data warehousing, and record management applications). Environments where both streaming and start/stop (access), large and small file workloads are required. Other target customers for the TS1140 Tape Drive are encryption opportunities in medium to large enterprises in the financial sector, government and public sector, and other industries that must protect their customer tape data from loss or theft. * This feature has been previously announced on other models. ** This feature has been previously announced on other models, but the description has changed. Parts removed as a result of a model conversion become the property of IBM. The Publications Center is a worldwide central repository for IBM product publications and marketing material with a catalog of 70,000 items. Extensive search facilities are provided, as well as payment options via credit card. A large number of publications are available online in various file formats, which can currently be downloaded free of charge. Publications in national languages will be available with thirty days after the Planned Availability date. Note: * External AC/DC power supply losses and heat output not included. Each TS1140 E07 Tape Drive comes with GMR head technology and dual-ported switched fabric 8 Gbps Fibre Channel attachments, for attachment to multiple servers or a single server with redundancy. It can be attached to IBM Power Systems, IBM System i, IBM System p, IBM System x and other servers running AIX, HP-UX, Linux, Oracle Solaris, and Microsoft Windows operating system environments. The TS1140 E07 Tape Drive is for installation in a TS3500 or racks that enable stand-alone installations. For all installations, the tape drive comes enclosed in a canister. For rack installation, a left drive cradle with a shelf must be installed before the right drive cradle can be installed. For both installations, cradles include redundant hot-swappable power supplies for both tape drives, as well as logic cards for management of power, serial numbers, and ID identifiers, and must be installed before the tape drive canisters can be installed. For installation in a rack, feature #4674, up to two TS1140 E07 Tape Drives can be installed in each cradle feature (#4802 or #4812). The cradle requires 10 EIA units of rack space. Two cradles can be mounted on a shelf, for a total of 4 tape drives on a shelf. A 2.0 meter rack, without a tape controller, can thus contain up to 16 tape drives. A 2.0 meter rack with a tape controller, or a 1.6 meter to 1.8 meter rack without a tape controller can contain up to 12 tape drives. A 1.6 meter to 1.8 meter rack with a tape controller can contain up to 8 tape drives. If space is available, an existing customer rack may be used. Refer to 3592 Sales Manuals for further information. Up to twelve TS1140 drives can be installed in a 3584 Model L22, L23, D22, or D23 frame. The 3584 Model L22 or L23 Base Frame and Model D22 or D23 Expansion Frame are designed for TS1140 Model E07, TS1130 Model E06, TS1120 Model E05, and 3592 Model J1A Tape Drives and 3592 cartridges. Each frame supports up to twelve tape drives with an incremental reduction of storage slots for each set of four drives installed. Note: For Models L23 and D23, the previous version of 3592 Fibre Drive Mounting Kit feature (#1513) is not compatible with TS1130 and TS1140. Appropriate Fibre Channel cables should be ordered for each tape drive. Refer to the Cables section for a list of available cables. Also, refer to the Fibre Channel Cables section of the Special Feature Codes in the 3592 Model E07 Sales Manual for Fibre Channel cable information. 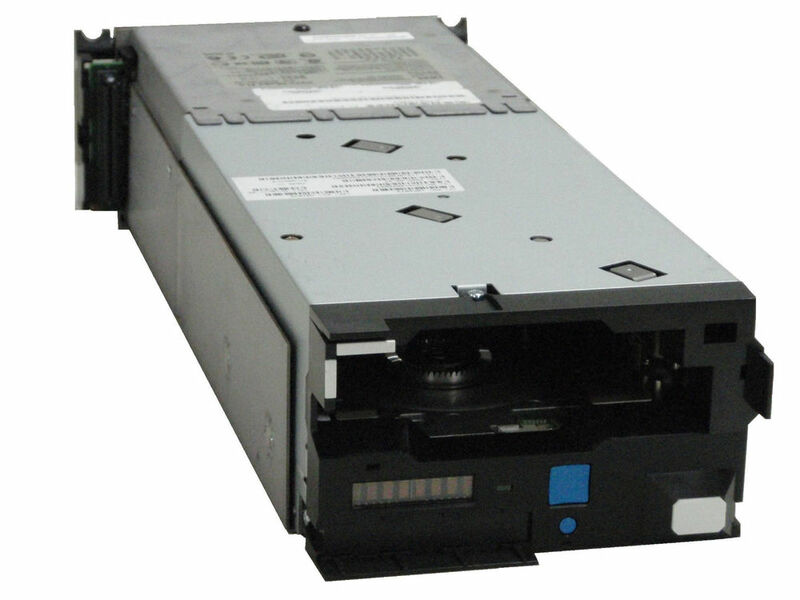 Labeled or initialized cartridges for TS1140 E07 or TS1130 E06 Tape Drives can be ordered using machine type 3599. IBM Networking Services are designed to deliver convenient, packaged services to help reduce the complexity of planning, ordering, and installing fiber optic cables. The appropriate fiber cabling is selected based upon the product requirements and the installed fiber plant. IBM Networking Services has a comprehensive set of scalable solutions to address IBM cabling requirements, from product level to enterprise level. IBM Network Integration and Deployment Services for enterprise fiber cabling provides planning, IBM Fiber Transport System trunking components, and installation services for small, medium, and large enterprises. IBM Global Services has the expertise and personnel available to effectively plan and deploy the appropriate cabling with the future in mind. These services may include planning, consultation, cable selection, installation, and documentation, depending upon the services selected. These services are designed to be right-sized for your products or the end-to-end enterprise, and to take into consideration the requirements for all of the protocols and media types whether the focus is the data center, the SAN, the LAN, or the end-to-end enterprise. Contact your IBM representative for additional information on these services. The TS1140 Tape Drive may be installed and is supported in the IBM System Storage TS3500 Tape Library Models L22, L23, D22, and D23. The TS1130 encryption function requires a minimum level of microcode firmware level and is a customer's responsibility to load, configure, and maintain on the TS3500 Tape Library. Support for the TS1140 encryption function installed in a 19-inch Rack open-systems attached requires a minimum level of microcode firmware for any 3592 J1A Enterprise Tape Drive, TS1120 Tape Drive, TS1130, or TS1140 Tape Drive where you intend to use tape cartridges from a common tape cartridge scratch pool. The TS1140 E06 Tape Drive is supported by a variety of Fibre Channel Switches and Fibre Channel Directors. The support is dependent on server, operating system, and host bus adapter that is being used. Select "Compatibility Information", then "Independent Software Vendor Matrix (ISV) for 3592 Tape Drive" for the product. IBM continues to work together with the ISVs to support the TS1140 Tape Drive. Individual application vendors should be contacted for specific information and availability dates. Encryption support for the TS1140 Tape Drive in the TS3500 Tape Library, with Fibre Channel, is provided in i5/OS, AIX, HP-UX, Linux, Oracle Solaris, and Microsoft Windows operating system environments. The installation of a TS1140 Tape Drive with encryption may require code updates for System i, System p and supported open systems device drivers or storage management software. Although multiple systems may be attached to a TS1140 E07 Tape Drive, the systems cannot use the drive simultaneously. The TS1140 E07 can only be varied on-line to one system at a time. TS1140 E07 Tape Drives are not supported for attachment to a 3590 Controller Models A60, A50, A00, or 3592 Model J70 Controller. Physical planning is a customer responsibility. Current levels of the open systems device drivers should be obtained to ensure the TS1140 E07 is supported. For information on these requirements, refer to IBM System Storage 3592 Tape Drive and Controller Introduction and Planning Guide 3592 Models J1A, E05, E06, EU6, E07, J70 and C06,GA32-0555. You are responsible for downloading or obtaining from IBM, and installing designated Machine Code (microcode, basic input/output system code (called BIOS), utility programs, device drivers, and diagnostics delivered with an IBM machine) and other software updates in a timely manner from an IBM Internet Web site or from other electronic media, and following the instructions that IBM provides. You may request IBM to install Machine Code changes; however, you may be charged for that service. Appropriate Fibre Channel cables should be ordered for each tape drive. Refer to the Cables section for a list of available cables. Also refer to the Fibre Channel Cables section of the Special Feature Codes in the 3592 Model E07 Sales Manual for Fibre Channel cable information. For users and remarketers: IBM TS1140 media supplies can be ordered directly through AAS using machine type 3599. IBM TS1140 media supplies can be also purchased through Priority Fulfillment Services and its distribution channel in North America, Latin America, and Asia Pacific. These TS1140 media supplies can be purchased through Forex Telegistics BV and its distribution channel in Europe, the Middle East, and Africa. For information about Priority Fulfillment Services distribution channels, call +81-3-3808-8486 in Japan or 1-972-881-0733 outside of Japan. This product uses the security and auditability features of host hardware, host software, and application software. General reference information for the 3592 E07 tape drives. With higher performance, reliability, cartridge capacity, and smaller size as compared to the IBM TotalStorage Enterprise tape drive 3590 models, the 3592 tape drives allow a reduction of your number of tape drives and cartridges, and the associated floor space while greater overall storage capacity is achieved. AES 256-bit data encryption capability increases security with minimal performance impact. Up to 250 MB/s native data rate for the Model E07, six times faster than the Model J1A at 40 MB/s. Up to 4000 GB (3725.3 GiB 1 native cartridge capacity for Model E07 on the IBM Tape Cartridge 3592 Advanced Data, more than a tenfold increase over the maximum 300 GB (279.39 GiB) native cartridge capacity of Model J1A on the 3592 Standard Data cartridge. Up to 1600 GB (1490.12 GiB) native cartridge capacity for the Model E07 and 1000 GB (931.32 GiB) for Models E06 and EU6 using the IIBM Tape Cartridge 3592 Extended Data. With the E07 tape drive at 3:1 compression, the maximum capacity is 4800 GB (4470.35 GiB), more than a fivefold increase over the maximum 300 GB (279.39 GiB) native tape cartridge capacity (900 GB [838.19 GiB] at 3:1 compression) of Model J1A with the Standard Data cartridge. Up to 500 GB (465.66 GiB) for Model E07 on the Advanced Economy cartridge with fast read and write access. Up to 4000 GB (3725.3 GiB) cartridge capacity for Model E07 on the Advanced WORM (write once, read many) cartridge for increased security of data. This capacity is more than a threefold increase over the maximum WORM capacities for Models E06 and EU6 on the Extended WORM cartridge, 1000 GB (931.32 GiB) on the Model E06, 700 GB (651.93 GiB) on the Model E05. Scaling capability to optimize fast access, storage capacity, or a combination of both. Dual ported switched fabric Fibre Channel attachments. High reliability and availability design. Smaller form factor that allows double the number of drives, which are compared to the 3590 tape drives, in a single 3494 frame or stand-alone rack. Note: The actual throughput that you can achieve is a function of many components, such as system processor, disk data rate, data block size, data compressibility, input/output (I/O) attachments, storage area network (SAN), and the system or application software. Although the drives can achieve rates of 240 MB/s (Model E07), other components might limit the actual effective data rate. The Model E07 tape drive comes with dual ported, switched 8 Gb/s Fibre Channel attachments for attachment to multiple servers or a single server with redundancy. The E07 can attach to the 3592-C07 or TS1120 (3592 C06) controller. The 3592-C07 tape controller supports only FICON channels for attachment to ES/3090, ES/9000, S/390, or zSeries systems. The 3952-C06 tape controller uses ESCON or FICON ESCON or FICON channels for attachment to ES/3090, ES/9000, S/390, or zSeries systems. Note: This product might not be certified in your country for connection by any means whatsoever to interfaces of public telecommunications networks. Further certification might be required by law before making any such connection. Contact IBM for information. Note: Do not connect an IBM tape drive directly to a public optical network. Use a connectivity device between an IBM tape drive optical fibre adapter and an external public network, such as a patch panel, a router, or a switch. You do not need an extra connectivity device for optical fibre connectivity that does not pass through a public network. Figure 1 illustrates the 3592 tape drive. The maximum number of 3592 tape drive attachments in environments with and without a tape controller. Characteristics of the 3592 tape drives. An overview of the operator controls for the 3592 tape drives. Tape cartridges and tape formats that are compatible with the 3592 tape drives. Reference information about the tape drive emulation mode. Parent topic:Overview1 One gibibyte (GiB) = 2 30 bytes = 1,073,741,824 bytes = 1024 mebibytes (MiB). See Data storage values. 3584 Model L22/L23 See note 1. 3584 Model D22/D23 See note 2. The number varies depending on the number of I/O slots, the number of storage slots, and the type of "Capacity On Demand" feature installed. The absolute maximum number is 12. The number varies depending on the number of storage slots installed. The absolute maximum number is 12. 2.0-meter rack (IBM Model 7014-T42) Up to 12 Note: A total of 16 drives can be attached with multiple racks. Table 1 shows the Enterprise Tape Cartridge 3592 characteristics, including capacities. 1 One gibibyte (GiB) = 230 bytes = 1,073,741,824 bytes = 1024 mebibytes (MiB). The 3592 tape drive is installed in a canister, which is a hot-swappable/quick disconnect field-replaceable unit (FRU). Installation and replacements are completed by qualified IBM Service Representatives only. The tape drive and canister do not have their own power supply, but are powered on when the canister is plugged into a drive cradle or frame installation. Once power is supplied to the unit, the drive runs several self-tests. The 3592 tape drive is typically managed through an automated library manager or host, and its associated software. A display, buttons, and indicators are available on the front of individual drives when manual operation is required. The front panel of the drive has an 8 character Display panel, an Unload button, a Reset button, and an LED power indicator. See Table 1 for a description of their functions. Display panel An 8-character light-emitting diode (LED) display panel, which displays drive status codes and also a limited actions menu. Mount messages, attention messages, drive status messages, and FID (failure ID) messages can also be displayed. Unload button The Unload button is used to manually unload a tape from the drive. If you press this button while a tape is loaded, the drive completes any operation in progress, rewinds, and unloads the tape cartridge. Reset button The Reset button generates a drive reset. Current tape motion is terminated and stopped before the drive is reset. The button is recessed to prevent accidental activation. Use a pencil or small screwdriver to press the reset button. LED power indicator A green LED power indicator shows whether power is provided to the drive. As part of the power-on process, the LED automatically lights and the drive completes various power-on self tests. Enterprise Format 1 (EFMT1) used by the 3592 J1A Tape Drive , and the 3592 E05 Tape Drive in both native and J1A emulation mode . This format records 512 tracks on 8 channels. The 3592 E06 tape drive and 3592 E07 tape drive with code level D3I3_5CD or higher reads data that is written in EFMT1 format but does not write in EFMT1. Enterprise Format 2 (EFMT2), used by the 3592 E05 Tape Drive, and the 3592 E06 Tape Drive. This format records 896 tracks on 16 channels. When the drive is operating on encrypted data at this density, the recording format is Enterprise Encrypted Format 2 (EEFMT2). Enterprise Format 3 (EFMT3), used by the 3592 E06 Tape Drive and the 3592 E07 Tape Drive . This format records 1152 tracks on 16 channels. When the drive is operating on encrypted data at this density, the recording format is Enterprise Encrypted Format 3 (EEFMT3). Enterprise Format 4 (EFMT4), used by the 3592 E07 Tape Drive. This format records 1664 tracks on JB and JX cartridges and 2176 tracks on JC, JK, and JY cartridges on 32 channels. When the drive is operating on encrypted data at this density, the recording format is Enterprise Encrypted Format 4 (EEFMT4). The 3592 E07 Tape Drive uses the Advanced Data (type JC) and Advanced WORM (type JY) cartridges. Both the type JC and JY cartridges have a maximum capacity of 4000 GB (3725.3 GiB). The 3592 tape drive models E07 , E06, and E05 use 3592 Extended Data (type JB) and Extended WORM (type JX) with a maximum capacity of 1600 GB (1490.12 GiB) with EFMT4 format, 1000 GB (931.3 GiB) with EFMT3 format, and 700 GB (651.93 GiB) with EFMT2 format. The 3592 E07 Tape Drive with code level D3I3_5CD or higher, can read format EFMT2 but does not write EFMT2 format. The 3592 tape drive models E06, E05, and J1A use 3592 Standard Data (type JA) and Standard WORM (type JW) cartridges with a maximum capacity of 640 GB (596.04 GiB) with EFMT3 format, 500 GB (465.66 GiB) with EFMT2 format, and 300 GB (279.39 GiB) with EFMT1 format.The 3592 E07 Tape Drive with code level D3I3_5CD or higher, can read only cartridge types JA and JW. The 3592 tape drive models E06, E05, and J1A use 3592 Economy Data (type JJ) and Economy WORM (type JR) cartridges with a maximum capacity of 128 GB (119.21 GiB) with EFMT3 format, 100 GB (93.13 GiB) with EFMT2 format, and 60 GB (55.88 GiB) with EFMT1 format. The 3592 E07 Tape Drive with code level D3I3_5CD or higher, can read only cartridge types JJ and JR. The 3592 E07 tape drive uses the 3592 Advanced Economy (type JK) cartridge with a maximum capacity of 500 GB (465.66 GiB) with EFMT4 format. Reads and writes EFMT3 and EFMT4 formats. Reads EFMT2 format and with code level D3I3_5CD or higher, EFMT1 format. EFMT3 can be written only with JB and JX media and EFMT4 format can be only written with JB, JX, JC, JY, and JK media. Operates only in native mode. See Tape drive emulation mode support. 3592 tape drives cannot read cartridges that are written by 3590 or 3490 tape drives. Cartridges that are written by the 3592 tape drive cannot be read by the 3590 or 3490 drives. Even though the cartridges are similar in size, they contain different media and media formats, and are not interchangeable. 3592 drives that are manufactured before the general availability of WORM capability must have a microcode update to read/write WORM cartridges. Drives without the updated microcode reject the WORM cartridges. 3592 tape drives need a code update to recognize an encrypted (EEFMT2, EEFMT3, and EEFMT4) cartridge. Without the update, the media is ejected by the library. Although multiple systems can be attached to a 3592 tape drive, the systems cannot use the drive simultaneously. The 3592 tape drive can be varied online to only one system at a time. 3592 tape drives are not supported for attachment to 3590 Model A50 or A00 controllers. The Fibre Channel Switch (8 Gb, 4 Gb, or 2 Gb) or 2109 switch that is attached to 3590 or 3592 tape drives cannot be shared with open systems servers if attached to a controller.